Laura Yecies | The Kitchen Sync | Thoughts on work, life, software and other topics. I was recently interviewed by Andrea Smith of CyberCoders on how to recruit and interview for startups. The war for talent here in the valley is fierce – I shared some of my approaches in this interview. Humans are social beings. We thrive in social groups and get work done more effectively when we team up with others. Good communication is key to the success of any group, and therefore it’s no wonder that tremendous technology investment and innovation has risen around fostering good communication. On the business side, team communication (aka Slack, Yammer, FaceBook for Work, Microsoft Teams) have evolved rapidly. Casual, personal messaging platforms have exploded with new tools, and a quick search of the Apple App Store yields multiple results—many of them with an attractive modern UI, thoughtful workflow, and clever feature set. Unfortunately, not all of the tools on the market have evolved to foster and support the many different ways we work together and communicate to reach our goals. What about Google Groups, Yahoo Groups and Listserv? Log in to Google Groups or Yahoo Groups (or any ListServ in use by your organization) and you will enter a time machine transporting you back to the distant technology past, circa 1986, when ListServ was invented. Google and Yahoo entered the mix by 2001 with the acquisitions of E-Group and Deja News which combined list mailing with newsgroups and threaded discussions. It is interesting that these products were not even built in-house, and I know from my personal experience, as General Manager of Yahoo Mail, that Yahoo Groups received minimal investment. The widespread use of these groups cannot be overstated; estimates from internal sources reveal that there are more than one billion active groups with hundreds, and sometimes even thousands, of members. Furthermore, these groups are far from being graveyards or time capsules. While the last product update was over three years ago, billions of messages continue to be shared in these groups each month. As is often the case with big companies, Google and Yahoo focus on other products with much larger revenue. Older products that generate less revenue, such as Google Groups, ultimately get ignored and become abandonware. While some exciting new products rise from emerging markets, another fertile ground for startups is revolutionizing the technologies with large user bases that have become abandonware. By staying laser focused on solving customer problems, these startups can fill a long-sought need among users who feel the frustration of being stuck with free tools that cost too much in time in efficiency to be worth the cost. Professional group and network communication is no exception and that huge opportunity led to the founding of Mobilize. The founders of Mobilize, Sharon Savariego and Arthur Vainer, observed that many of these groups are of critical importance to their leaders, and the companies or organizations they support. These leaders need modern tools: a powerful, easy to use member database and an all-in-one solution for email, SMS, events with build-in-analytics. Our observation and thesis was validated by dozens of brand name customers such as Prezi, Looker, Etsy and Docker who transitioned off of Google and Yahoo groups to Mobilize to manage their thousands of global partners. For many years, these leaders had suffered from lack of efficiency—piecing together Google Groups, Meetup, Eventbrite, Excel and Doodle. With Mobilize, they finally had an integrated, efficient, professional system they could leverage to dramatically grow their groups and increase engagement. What’s more, Mobilize makes it super easy to convert existing Google and Yahoo Groups to the robust functionality of Mobilize Groups. After using the import wizard, leaders have at their fingertips a robust database of their members, powerful communication tools including email, SMS, polls and events and powerful analytics. Learning from our customers’ successes, a positive feedback loop ensued with Mobilize making improvements and adding features that attracted new customers. Clearly Google and Yahoo saw their Groups product as simply a consumer tool with limited revenue opportunity and put their priorities elsewhere. At Mobilize, we recognize the huge need for professional group communication with a well designed platform. The rapid adoption of Mobilize by over 150 leading brands is proof of this unmet need. In the new economy, organizations increasingly rely on large groups and networks outside their organization to achieve their missions—groups have become business-critical. More than 5,000 group leaders are using Mobilize to communicate with over 250,000 group members, and the platform is flexible enough to support groups as diverse as brand ambassadors, developers, marketplace sellers, resellers, product beta testers and many more. We estimate the professional group communication market to be valued at $65 billion. It’s growing quickly—driven by the increasing importance of network-driven businesses which require a robust platform. For that reason, it’s an exciting space to be working in, and one I’m thrilled to be supporting. I’ve had the good fortune of being able to spend the majority of my career helping to build and market products with a core mission of helping people improve their productivity as it relates to communication. Netscape Communicator, ICQ, AIM, Yahoo! Mail, SugarSync and Catch – these products served slightly different purposes at different points in our internet and mobile journey but our goal was always the same – improvement of connectivity – not of infrastructure, but human connectivity. Our most basic instincts as humans are to communicate with others through any means possible – words, touch, pictures, sound. Communication is one of the most basic functions in business and it’s not always easy to do it well. When I was working at Netscape, I had a conversation with Jim Barksdale that has stuck with me. He said that making things happen in business is about writing it down. You can discuss things all you want but it is the leader’s job to put the plans into writing and confirm that they are understood and acted upon. Pre-internet that meant a memo written on paper with the associated headaches of duplication and distribution. The beauty of email is that you have the power of the written word with the convenience and ease of our new technologies. Email is such a powerful tool that it survives as the default written communication tool and – despite its many flaws and forecasts of its demise – it persists. With new technologies, we are enabling effective action through writing by optimizing the communication app for particular settings. For instance, multiple styles of chat apps for various demographics and types of groups – friends, family and work teams. But, what if different people in the same stream of communication have different preferences in tools? What if you are trying to recruit or incent these different people who are not your employees and mandating a particular tool were a turn-off? There has been a need for a communication platform that has a lighter touch – that gives recipients greater control, while remaining effective. Initiators can encourage participation and lead particular actions. These initiators, the group leaders, are constantly recruiting and incentivizing their members and they need a tool that supports them, so their companies and missions can scale effectively. In Mobilize (www.mobilize.io), I saw just such a platform. Some of the design points are subtle and some are very concrete but it is an incredibly thoughtful way to communicate with groups, particularly those that are not within company walls. After being introduced by my business associate, Ajay Chopra, and meeting with the cofounders, Sharon Savariego and Arthur Vainer, I was convinced that we shared a vision for a new type of communication method, in fact a new category of communication platform, designed expressly to support group communication and help leaders mobilize action. That action can be anything from brand advocacy to software development advances to product sales to volunteering to give blood. I am thrilled they invited me to join the company as COO three weeks ago and look forward to working to scale this exciting idea for so many more groups and companies globally. I believe that’s why I found the concept of “Beginner’s Mind” so important when I began my journey of learning about Mindfulness. Beginner’s Mind or “Shoshin” is a concept in Buddhism. It refers to having an attitude of openness, eagerness, and lack of preconceptions when studying a subject or performing a task. The key point is to suspend judgment or assessment when taking on a new activity. Most children suspend this judgement naturally. Our society doesn’t expect them to be experts but more importantly, they don’t expect it of themselves. The inner critic’s loud voice, that so often holds adults back, has not kicked in for most children. If you think back to all the things that you learned as a child that you do well now, you typically journeyed along a path where you went from absolute clumsiness to unthinking expertise. This applies to both mental and physical skills. We were able to do this in part because of our mindset of Shoshin. Nobody expects a new young violinist to play in tune and we tolerate that long, squeaky, out of tune period knowing, of course, that it is an unavoidable stage on the path to musicianship. Mis-conjugation of a verb is almost cute by a child but can be horribly embarrassing for an adult. Of course intellectually we know that adult learners go through that same awkward phases as do children and if we can only accept that phase in ourselves we could achieve and enjoy so much. But somehow we can’t. We often fear embarrassment but the reality is that most people are their own worst critics. Holding ourselves to inappropriately high standards is an even greater risk when we are trying to relearn a skill. I experienced this recently with my violin playing. I studied the violin starting at three and a half and continued throughout high school and college. When I applied to and attended a liberal arts college I decided that I would not be pursuing music as my profession though I still studied and played in college. Once I became a parent and was juggling motherhood with graduate school and a career I could not find the time for my violin playing and the violin sat pretty much untouched for 28 years. It wasn’t that I never thought about playing. In fact I missed it – but knowing how rusty I was, the idea of playing at that level was intolerable to me. Interestingly I continued to play the piano occasionally but since I had never been a very good pianist, it didn’t bother me as much to hack around. I finally got over the hump through a combination of lucky circumstances and my mindfulness training. The two lucky circumstances were my friendship with George Whitehill – a colleague in my Vistage group and meeting Claudia Bloom. I witnessed George’s journey from pure beginner to accomplished pianist/composer and was seated at a wedding next to a wonderful and encouraging teacher Claudia Bloom. Timing was fortuitous, my youngest son Adam was about to go to college and after talking to Claudia I realized that this was the time. It was a painful first few months of lessons and practicing, especially when I realized that the piece I was working on was one I studied in 6th grade! On the other hand, I also realized that once I mastered the technique required for that piece, I could play it with greater expression and, frankly, enjoyment than I had 40 years earlier, a humbling yet rewarding experience. Like many others in the corporate world I did many Myers-Briggs tests and the results were consistently INTJ (though I moved closer towards ENTJ over time). I always hated the “J” (judgement) label – I aspire to be an empathetic, accepting and tolerant person – I didn’t want to be judgmental and didn’t accept that I was until I realized during my first mindfulness class (and reading a wonderful book “How Good do We Have to Be”) that I was in fact judging. I just most frequently pointed the judgement lens at myself and not always kindly. It is hard indeed to find the right balance of setting high goals and standards, working and trying hard yet accepting our own imperfections, missed goals or awkwardness. It is very hard to suspend judgement while we learn as adults. The payoff, however, is limitless. Among the most vexing issues on the topic of lack of women in tech is why is it different from other fields that have gone from being male dominated to gender balanced. After all, it wasn’t that long ago that virtually all doctors and lawyers were men. This disturbing chart in this story on NPR makes the point quite dramatically. Starting in the early ‘70’s, simultaneous with the rise of the feminist movement, women began making steady gains entering the professional and scientific fields. Over the course of the 30 years between 1970 and 2000 women went from about 10 percent to nearly 50 percent of the class at US Medical and Law schools. Even physical science graduate programs made strong gains. Computer science was on a similar trajectory then turned sharply down. Why? As I dug into the numbers it gets even more discouraging. 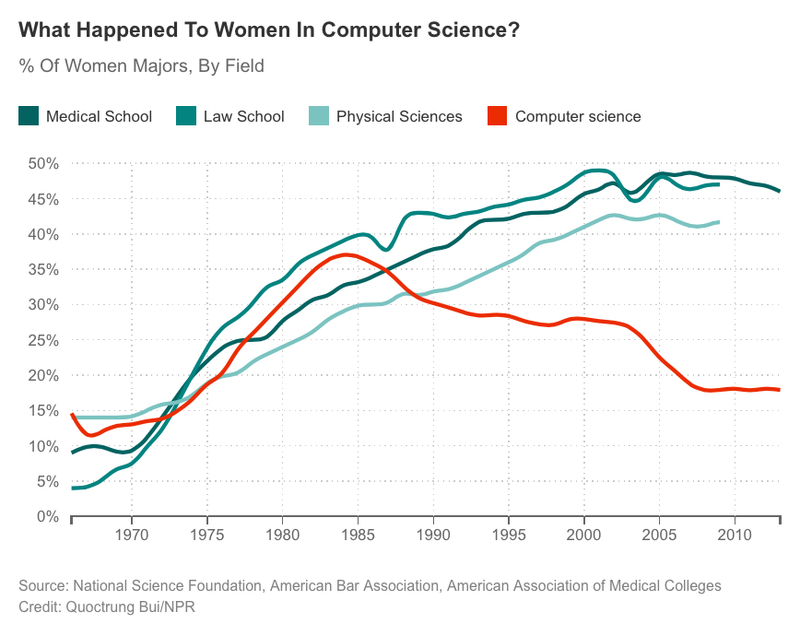 Not only are there fewer women computer science majors on a percentage basis, during a time when the field has experienced dramatic growth, the absolute number has been cut in half. The downturn started in 1984 which happens to correlate with the introduction of personal computers. The hypothesis posed is that the early personal computers were marketed to men and parents of boys. An example of this is this early Apple ad. Potentially these marketing strategies fostered a societal view that computers were for boys. This was reinforced throughout popular culture. While we saw women doctors and lawyers on TV and in the movies, the movies that show programmers have nearly all male protagonists – everything from Revenge of the Nerds and War Games to Firewall and The Social Network. It’s easy to follow the trajectory forward. Boys have more access to computers and programming experience growing up. Girls arrive at college with less experience then their male peers because they haven’t been programming on their own and are therefore at a disadvantage in the introductory C.S. classes. Even if they understand the theory the lack of hours of experience will be hard to quickly overcome. It is natural for students, their peers, families and professors to mistake this lack of experience with lack of aptitude. This was the finding of Jane Margolis, one of the foremost experts on disparities by race and gender in computer science, in her research at Carnegie Mellon. Some colleges such as Harvey Mudd and Carnegie Mellon are proactively dealing with this issue. They are making real progress – at Carnegie Mellon women in the class of 2014 comprise 40% of their CS majors. These programs at Harvey Mudd and Carnegie Mellon can and should be replicated. Making CS part of a core required high school curriculum could level the playing field. While discouraging for computer science, the chart above shows that change is possible. Like any major sociological change, though, there are not quick fixes. As parents, technology marketers and educators we need to step up.